Is it greedy to think “buy your own newspaper instead of reading mine”? If we use the classic “If a tree falls in a forest and no one is around to hear it, does it make a sound?”, I guess it’s not a problem. 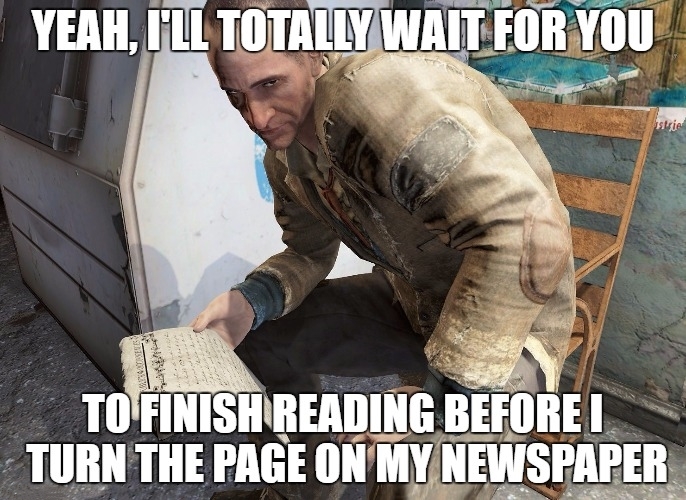 In other words, if the moocher reads your hard earned newspaper in a way that you don’t notice it, it has got to be ok, since you won’t notice it. If, on the other hand, the parasite leans in and introduces you to what he ate for breakfast, it’s an entirely different thing. A cool experiment: On a long commute, stay on the same page for 30 minutes and see if someone reacts. If your freeloader asks you to turn the page, he’s earned some feedback. And to not put the dearest producer of liquid personality enhancer in a bad light, a good-guy-Bobrow meme.